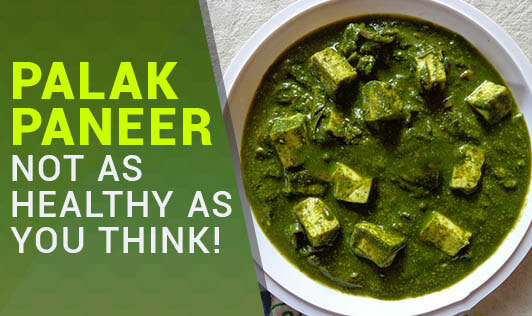 Palak Paneer - Not as healthy as you think! Palak paneer, just the name makes us feel ymmmmm!! Most of us think it is very nutritious as it has both calcium rich paneer and iron rich green leafy vegetables. No doubt it's tasty but let me tell you it's not as nutritious as we think. Spinach (Palak) also has high calcium content. However, the oxalate content in spinach also binds with calcium, decreasing its absorption. Calcium and zinc also limit iron absorption. The calcium in spinach is the least bioavailable form of calcium sources. By way of comparison, the body can absorb about half of the calcium present in broccoli, yet only around 5% of the calcium in spinach. Polyglutamyl folate (Vitamin B9 or folic acid) is a vital constituent of cells and spinach is a good source of folic acid. Boiling spinach can reduce more than half the level of folate left in the spinach, but microwaving may not affect folate content. A distinction can be made between older varieties of spinach and more modern varieties. Older varieties tend to bolt too early in warm conditions. Newer varieties tend to grow more rapidly but have less of an inclination to run up to seed. The older varieties have narrower leaves and tend to have a stronger and bitterer taste. Select for the soft one, make sure it doesn't smell sour and also look for good brand which specifies manufacturing and expiry date. Keep it low fat to make a low calorie dish. Think before you order for a palak paneer!